Previously, on MinerBumping... 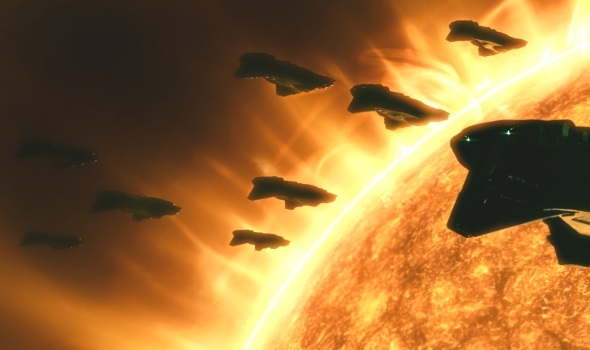 Agent Alt 00 deployed a fleet of Catalysts against Djsky, a Russian Orca miner. 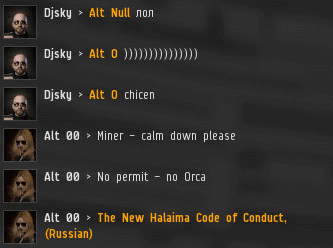 In the aftermath of Alt's victory, one of Djsky's comrades, Ilya Shcagin, accidentally invited Alt 0 to join the Russian miners' private channel. With the help of Google Translate, Alt sought to uncover the miners' secrets. WOLK Zwezdnii > damn .. if they continue to do this .. then someone pays?!?! Ilya Shcagin > how much does the orc donate cost? The miners were horrified to realize that EVE allows ganks and ransoms. Would the Russians pay for blue status? WOLK Zwezdnii > Ilya Shcagin well, L ..... the main rule is never negotiate with terrorists !! WOLK Zwezdnii > there will be no payments sooner or later themselves will be blamed! The Russians engaged in a heated discussion about the matter. Apparently the Hollywood cliché about not negotiating with terrorists has had an impact on Russian culture. Ilya Shcagin > the norms of the pancake. Our Agent interjected some Code-based advice. This inspired Djsky to break his silence. For the most part, he'd been too embarrassed by the loss of his Orca to play much of a role in the conversation. Ilya still couldn't figure out how to boot Alt 0 from the channel. For now, the miners would have to accept the fact that she could spy on their deliberations. Slowly but surely, the miners fell into a familiar pattern. They considered one EVE game mechanic after another. How could they stop the New Order? Iliaas fgnghm > who wants to fight? The miners couldn't come up with any good options. 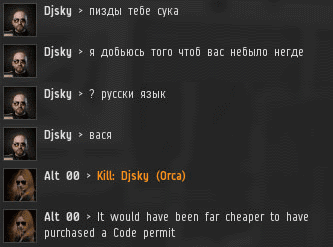 But they knew they wanted revenge for Djsky's Orca. Djsky > Eostella (Dawn), which shines on everything that is on earth and on the most immortal gods who live in the widest sky. Iliaas fgnghm > Where are they? 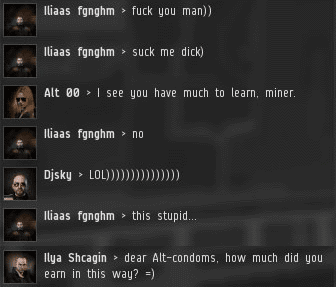 Alt 0 was watching the convo, but the miners were watching our Agent, too. They knew she had at least ten gank alts at her command. WOLK Zwezdnii > people, yes hammer on them !! they want to attract attention! there will be no reaction to them will become uninteresting and will be swindled! WOLK Zwezdnii > who can not wait to fly away to another place and there dig! Given enough time, every carebear organization will come up with the idea of trying to bore their opponents to death. WOLK Zwezdnii advised his fellow miners to keep quiet and starve our Agent of content. Maybe then she'd go away. The proposal of this strategy is a sure sign of defeat on the part of the carebears. Eventually, the Russian miners procured a moderator capable of booting Alt 0 from the channel. They were then able to resume the norms of the pancake, as the old Russian proverb goes. Luckily, Alt 00 was still able to communicate with the miners in Nakugard local chat. Though Djsky's comments haven't been translated, I assume they're a bunch of empty threats. If I'm right, my Russian is getting better--or the Russian miners are getting worse. After some parting words in local, the Russians associated with this corp evacuated from Nakugard. However, there was another ring of Russian miners still using fleets of Orcas to mine in the system. Unlike the group Alt 00 had just chased away, these Orca pilots were silent. They were bots, and heavily tanked ones at that. Even a fleet of Alt's Catalysts would be ineffective against them. Our Agent issued a warning: Winter is coming. CCP may allow botting, but we do not. wow just wow. antiganking is failing so hard across high sec. do they do anything but whine and cry in their top secret channel while needing code to provide them with content? Always first to post here. Grasping onto relevance. Did you get your ISK back from Zopiclone yet? Or are you avoiding subbing back up because of being banned too many times and choosing to live vicariously through James? Keep posting first! It’s amazing to see year over year of failing so incredibly hard. More autism than the miners. "They were then able to resume the norms of the pancake, as the old Russian proverb goes." When will CODE gank Google Translate? They need to plink toenails by rotary hedgehogs, right? Salutations and winds blowing you friendly! The norms of the pancake dictate that this will be the winter of great content.